The ultimate note-taker for business? A powerful note-taking app that keeps all your ideas together across multiple devices. OneNote may not be as well known as Word, Excel or PowerPoint, but it can be just as useful – depending on how you work and organize your files. It's designed to be the ultimate in digital note-taking, and gives you a very broad canvas to work on. Sketches, lists, clippings, photos, tables... OneNote is able to handle it all, and keep all your notebooks synced across all your devices, too (thanks to some recently improved mobile apps). Here's what you get with OneNote as part of Microsoft's Office 365 subscription or as a one-off Office 2019 purchase. As with the other key components of Office 365, OneNote is based around the ribbon menu, though you'll probably be making less use of it than you might in Word, Excel and PowerPoint. Not only are there fewer options and features to display, OneNote encourages you to start typing or drawing straight away, with your notebooks front and center. Overall, the software is designed to be flexible, which means there's little in the way of guidance or hand-holding here. It's not exactly difficult to use, but first-timers might need a few moments to work out what's what and how these different tools can be used. The lack of structure in the interface means you can do whatever you want with OneNote, really, but it can also make it quite daunting to get to grips with, and occasionally messy – words and text can be placed anywhere on a page and moved and reshaped as required. OneNote's interface is largely what you make of it. When you do need specific tools – for editing drawings, changing text styles, adding lists – you won't have too many problems accessing them. The Draw tab on the ribbon menu is a good example of the OneNote interface at its best: simple pen styles are available to pick from in a grid, with more advanced options present if you need them. The way OneNote is laid out doesn't feel quite as cohesive as its fellow Office apps, or even rivals like Evernote, but in many ways that's the nature of the beast. Add some more order to OneNote, and it gets more restrictive in terms of what you can do with it. As we've said, OneNote enables you to combine just about anything on a page: text, images, lists, drawings, tables, links, video, audio and more besides (audio and video can be recorded from right inside the app too). If you're using a touchscreen PC or tablet with a stylus, it becomes even more useful. Pages can be arranged into tabs and notebooks, with tags available to further categorize your notes. OneNote also ties in tightly with the other parts of Office 365 – there's a dedicated Spreadsheet button, for example, that you can use to drop in a sheet from Excel that updates as you change it in the other application. We like the sharing and history features built into OneNote, which can come in very handy if you're working on notebooks as part of a team (you need to store your notebooks in OneDrive if you want to collaborate on them in real-time). A couple of clicks is all it takes to roll back a page to a day, a week, or even six months ago as needed. The more you use OneNote, the more useful it becomes, and the more intuitive its features start to be. Individual notebooks can be customized with different colors and be password protected, if needed, and merging different pages together is actually simpler than you might expect – like a lot of OneNote's features, it only takes a couple of clicks. There is room for improvement: the cross-notebook search tool works well enough, but can be difficult to get any advanced use out of, while the relationship between the different components of OneNote isn't always obvious. Overall though, OneNote is impressively capable at turning its hand to all kinds of digital note-taking. In recent years Microsoft has started to pay more attention to OneNote Online, OneNote for Android, and OneNote for iOS. If you've got a note-taking app that needs to sync content across multiple devices, it makes sense to be able to access decent versions of the app no matter whether you're on a laptop or a smartphone. OneNote on the web doesn't quite offer the flexibility of OneNote on the desktop, but you can carry out the basics of inserting new text and images. It's also more neatly laid out, and more intuitive to use, with a cleaner interface – the ribbon menu focuses on fewer tools, with better use of color and icons. In fact, it's a lot like OneNote for Windows 10 – and Microsoft has said this Windows 10 app will slowly be replacing the more complex OneNote desktop program currently available in Office 365. Some of the less useful extras get stripped out, and you're left with a tool that's more focused and easier to get around. As for the mobile apps, they excel at viewing your notebooks wherever you happen to be – layouts are perfectly preserved, and you can usually get at everything you've stored just as you can on the desktop. One benefit of using the apps is being able to add photos and videos direct from your device's camera. The apps keep everything simple and straightforward, and while it's likely that you'll mostly just be using them to view notes, you can edit and create entries as well (it's just more difficult to play around with layouts on a smaller screen). Microsoft OneNote is included with Office 365 Business, which currently costs £7.90 per user per month (plus VAT) if you're paying annually ($8.25 in the US), or £9.50 per user per month (plus VAT) if you're paying monthly ($10 in the US). If you want to try before you buy, make use of the free 30-day trial, and you also have the option of a single purchase of Office 2019 – though that doesn't give you the ongoing updates or some of the cloud features. Not every business will find value in OneNote, but if you can find a use for the program, then it's a slick and competent tool that will keep all manner of text and images in sync across multiple devices, and help you keep disparate thoughts and ideas organized – a useful resource for all kinds of companies and teams. It strikes a good balance between the simplicity of something like Google Keep (now called Keep Notes) and the more advanced complexity of Evernote. 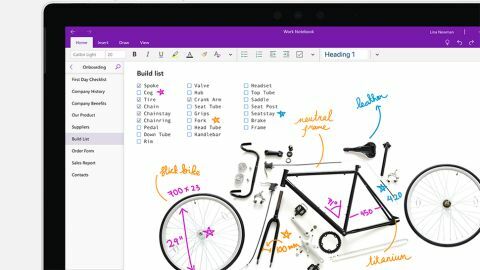 It seems like simplicity is the way forward, too, with Microsoft announcing it's focusing on the development of OneNote for Windows 10 – the universal app that works across desktops and tablets – in the future.